Winter is quickly approaching! We came across this article on NextStepLiving on how to prevent frozen pipes during the cold season! It's a sinking feeling straight out of the heart of winter: One morning you stumble out of bed, turn on the shower, and nothing comes out – or only a feeble trickle of water. The culprit? A frozen supply pipe, which means you or your pricey plumber could spend hours restoring the flow. Worse, you could find yourself with a burst pipe – an indoor geyser caused by expanding frozen pipes. That could lead to water and mold damages to your home’s structure (and more pricey repairs). To prevent frozen pipes altogether, there are some precautionary measures you can take today, and one long-term solution. Turn up the thermostat, or just don't turn it down at night. Leave a trickle of water running from any suspect pipes. Wrap supply pipes with heat tape or sleeve insulation. If a pipe does freeze, try carefully warming it with a hair dryer until the water is flowing normally. 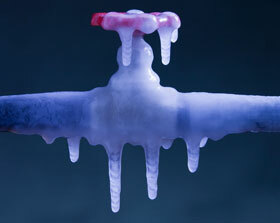 Thinking Long-Term: The biggest cause of frozen pipes is just that –they’re cold. By fully insulating all of those unheated spaces and exterior walls in your home, you’ll keep all of your water-supply lines warm enough to avoid freezing. Air sealing to fill holes and cracks in the exterior of your home. Insulation to put a thick blanket between winter and your pipes. Energy advisors have a number of tools at their disposal to detect holes in your home’s envelope – including, in cold weather, an infrared inspection to visualize where heat is escaping. You might be surprised to see how much heat your pipes (among other culprits) are letting escape. One more thing: If a pipe ruptured in your house tonight, would you know where to find the main water shutoff? Go find it!